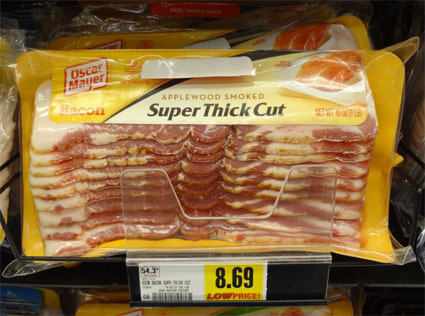 Grandma Slump: How About Bacon Almost $9 A Pound? I went to pick up a pound of bacon today. Afterward, I chose something else. $8.69 a pound, the "Low Price!" on this particular brand. Which as far as I'm concerned can rot on the shelf, phooey on them! Someone else, in a post called "OMG! the Price of Bacon!" said a couple days ago that many brands were $8/lb, and "I honestly felt like I was walking into the 'Twilight Zone'." I hadn't noticed this. It's been a while since I've personally shopped for bacon. And now it might be a while longer before I do it again!